Does the sign of scores or of loadings in PCA or FA have a meaning? May I reverse the sign? 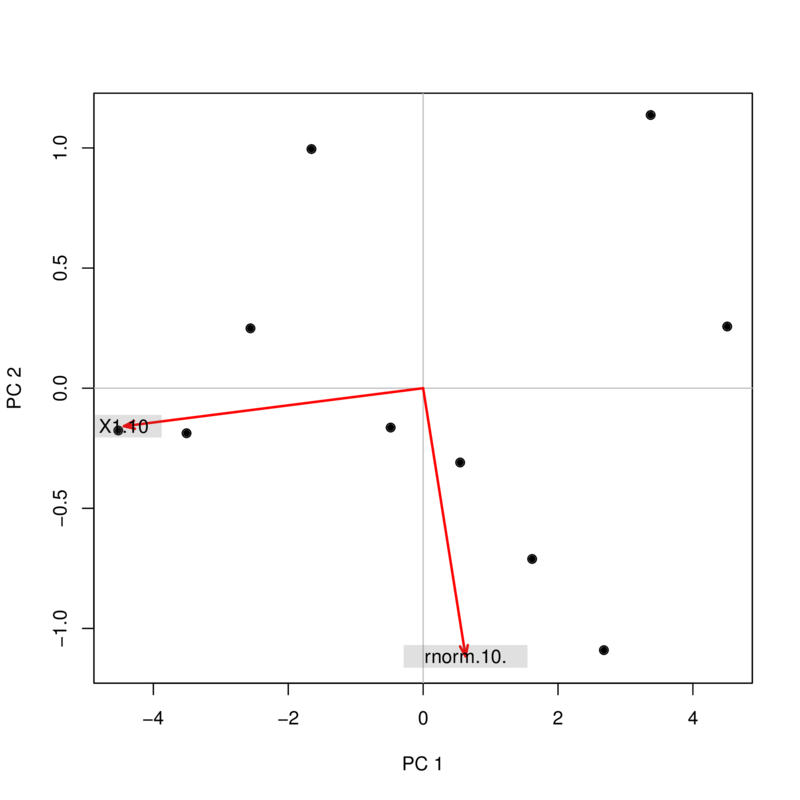 I performed principal component analysis (PCA) with R using two different functions (prcomp and princomp) and observed that the PCA scores differed in sign. How can it be? Why do the signs (+/-) differ for the two analyses? If I was then using principal components PC1 and PC2 as predictors in a regression, i.e. lm(y ~ PC1 + PC2), this would completely change my understanding of the effect of the two variables on y depending on which method I used! How could I then say that PC1 has e.g. a positive effect on y and PC2 has e.g. a negative effect on y? In addition: If the sign of PCA components is meaningless, is this true for factor analysis (FA) as well? Is it acceptable to flip (reverse) the sign of individual PCA/FA component scores (or of loadings, as a column of loading matrix)? So, why does the interpretation stays the same? You do the PCA regression of y on component 1. In the first version (prcomp), say the coefficient is positive: the larger the component 1, the larger the y. What does it mean when it comes to the original variables? Since the weight of the variable 1 (1:10 in a) is positive, that shows that the larger the variable 1, the larger the y. Now use the second version (princomp). Since the component has the sign changed, the larger the y, the smaller the component 1 -- the coefficient of y< over PC1 is now negative. But so is the loading of the variable 1; that means, the larger variable 1, the smaller the component 1, the larger y -- the interpretation is the same. 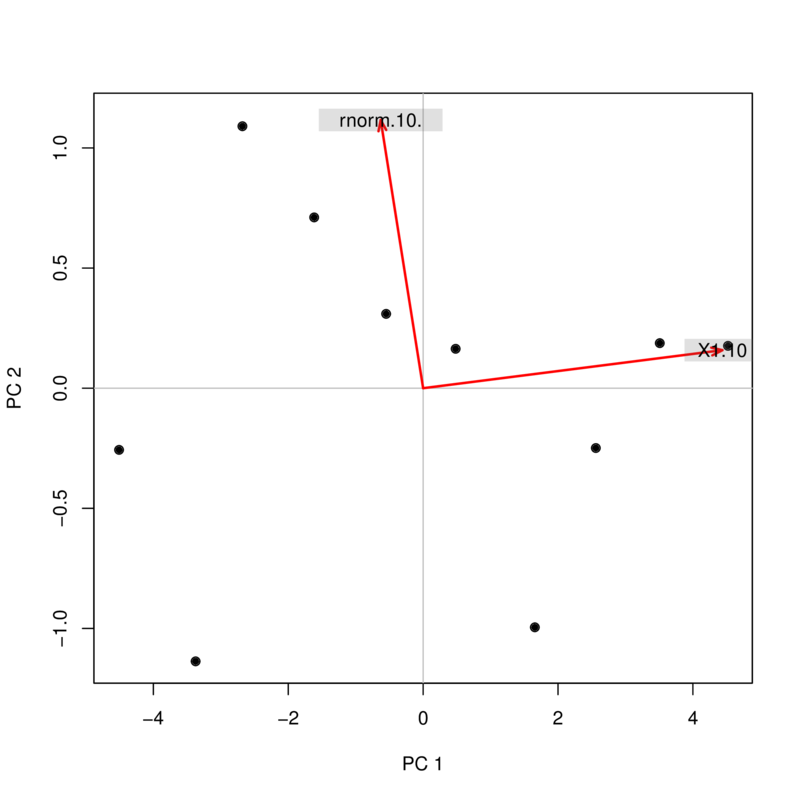 Possibly, the easiest way to see that is to use a biplot. As you see, the images are rotated by 180°. However, the relation between the weights / loadings (the red arrows) and the data points (the black dots) is exactly the same; thus, the interpretation of the components is unchanged. This question gets asked a lot on this forum, so I would like to supplement @January's excellent answer with a bit more general considerations. The conclusion is that for each PCA or FA component, the sign of its scores and of its loadings is arbitrary and meaningless. It can be flipped, but only if the sign of both scores and loadings is reversed at the same time. This was well answered above. Just to provide some further mathematical relevance, the directions that the principal components act correspond to the eigenvectors of the system. If you are getting a positive or negative PC it just means that you are projecting on an eigenvector that is pointing in one direction or $180^\circ$ away in the other direction. Regardless, the interpretation remains the same! It should also be added that the lengths of your principal components are simply the eigenvalues. Not the answer you're looking for? Browse other questions tagged r pca factor-analysis or ask your own question. Is it acceptable to reverse a sign of a principal component score? How does pca() function in Matlab fix the sign of principal components? Is the sign of principal components meaningless? Is it possible to reverse the sign of factor loadings for one factor? How to reverse the sign of factor loadings in factor analysis? What does it mean to have a high/low value for a sample in the 1st principal component? How to interpret the loadings of the *second* principal component?